Franconia Village Most of the old pictures here are from a photo album of the personal collection of Murray Glines. Murray has Israel's River Trading Post (antique shop) on Main Street in Lancaster. Murray is a direct descendant of Israel Glines, one of the first explorers of northern New Hampshire. Israel's River in Lancaster, Randolph and Jefferson is named after Israel Glines. 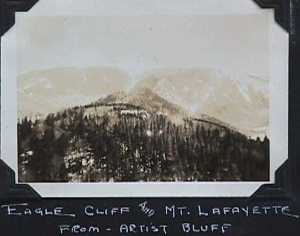 Artists Bluff is at the north end of Franconia Notch overlooking Echo Lake and the notch. Exit the parkway at NH Route 18. Head towards Franconia. Parking is by the lake or a short distance down the road on the right. It's a short but steep hike to the top. You're at the top of a cliff, so don't fool around. Take your camera and/or canvas and art supplies. The view is great!